Sunridge Homes Ltd. » Monterey Estates is a great place to live! Monterey Estates is a great place to live! Monterey estates is a great place to live because of the neighborhood. It is safe to walk in, it’s a perfect size yard to keep yourselves active. 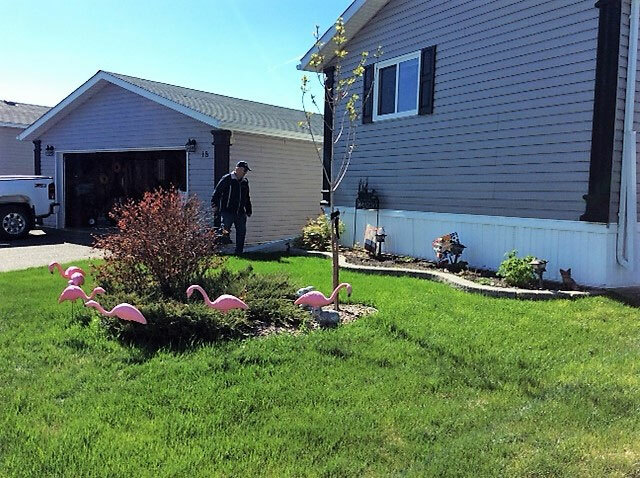 As in the above picture, there are wonderful neighbors that make sure special birthdays don’t go unnoticed and even decorate your lawn for you, then enjoy many social get togethers. These wonderful neighbors also look out for each other to make sure we all are doing well. The homes are one level for easy accessibility and easy to keep. There is assistance available when you’re not able to do your yard work yourself but can still appreciate the green space. The north hill is very accessible to the highway or downtown. Yes, Monterey estates is a great place to live and am happy to reside here.